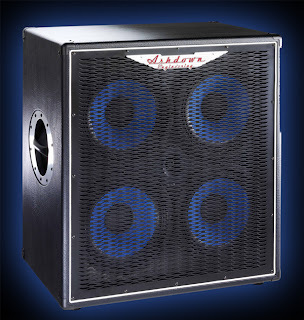 When last we discussed our hero, he was having trouble getting the Ashdown MAG 600R to play nice with his 2 4X10 cabs. Cutting to the chase, there's a very strong likelihood that the amp was not responsible, but rather that the cabs were wired out-of-phase. Go figure. I applied that quintessential American solution: buy more crap. I was lucky enough to be able to sell one of the cabs, and I bought a playmate for the amp head: an Ashdown ABM 414t. The 414t is a 4-ohm 4X10 cabinet in Ashdown's uprated ABM line. What separates this from the MAG speaker line and makes it uprated are the cabinet construction (made of birch plywood rather than the MAG's composition board), and heavier speakers. These speakers yield a very high sensitivity rating of 103dB at 1watt at 1meter, which was what I was after - a single cab to maximize the volume of the MAG 600's 575 watts. There are other details about the cab which can be found in other places on the net. 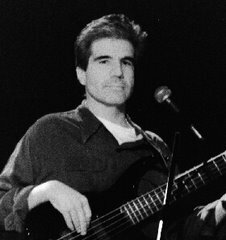 When testing it in the store, Washington Music, Tod Eliot noted and marveled that the punchiness hit him in the chest from about 8 feet away. I concur; the sound is a beast. At the gig, there was a huge difference between the 414t and its predecessor, a Peavey 410TX. While the TX is no slouch, the 414t was louder and punchier, definitely a good complement to the head. The downsides to the 414t had nothing to do with the sound. First, it's expensive. A good price for one is about $700. Second, although it's on the small side for a 4x10 cab, it's heavy - approaching 100 lbs. Third, The handles on the sides absolutely stink. My wrists were smashed trying to carry it with another person. Fourth, for the money, Ashdown should put wheels on this thing (which I did), and include a cover for it. Fifth - and this is a biggie - the switch plate on the rear for speaker connections and tweeter control is not routed deeply enough. On my cab, it actually protrudes about 3/8", exposing the controls to damage when transporting the cab. Ashdown needs to address this immediately. So, non-playing issues aside, this is an excellent-sounding cab, and a great match for the MAG 600R. Just watch out when moving it to the gig.